A tough and resilient outdoor gas pizza oven, this hardy Lifestyle Milano Deluxe Garden Pizza Oven is formed of pure stainless steel, making it the ideal outdoor or garden cooking companion. Are you looking forward to enjoying the warm outdoor summer months and hosting a barbecue or two this year? With a spacious three-tier gas pizza oven such as this, you can give your family and guests the option to make their own authentic, home-cooked pizza in minutes. A neat feature of this natural gas pizza oven is its wood chip smoker box, which helps to give your home-baked pizza that genuine Italian pizzeria flavour. With three cooking racks, you can have several pizzas on the go at once, so there’s no need to keep taking it in turns. Ideal for any outdoor occasion where a lot of hungry people are invited! The heat-resistant handle helps to prevent accidental burns, especially when there are little hands and fingers wandering around. This outdoor gas pizza oven is easily maneuverable thanks to its in-built wheels, so you can wheel it out of the shed or garage whenever needed. It comes with a hose and gas regulator as standard, so there is no need to buy them separately – although you will need to buy the propane separately. The Lifestyle Milano Deluxe Garden Pizza Oven is easy to operate, as it has an electronic impulse ignition that heats it swiftly and safely, incorporating the scent of the wood chip smoker. In terms of aesthetic, this pizza oven has a rather industrial look thanks to its stainless steel exterior, which might not be for everyone, especially those who want something more rustic. However, it does make it easier to clean. 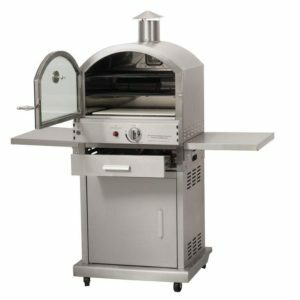 As well as its three cooking racks, this gas grill pizza oven has two useful fold-away shelves that can be used to hold freshly baked pizzas, so they don’t take up excess table space. These shelves can be easily folded down to save space when they’re not needed – great for storage purposes, etc. With dimensions of 150cm x 140cm x 65cm, it’s larger than the average gas pizza oven, but makes up for its size by handling several pizzas at once. A nice feature of this pizza oven that’s worth mentioning is the front view window, which allows you to keep an eye on how your pizza is cooking without releasing excess heat. There is an attached temperature gauge – perfect for ensuring that your pizza oven has reached the optimal temperature. 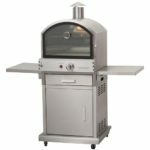 All in all, this gas pizza oven may not be exactly what the Italians originally envisaged, but it is a safe and convenient option for the home that will cook crispy, great-tasting pizza every time.